This is my favorite time of year. I love the feeling at Christmastime. I love that you sometimes witness some act of generosity that you may not the rest of the year. I love getting and decorating our tree. I look forward to seeing my kids' faces when they open their presents. I also love wrapping the gifts. I was inspired this year by my sister in law Cheryl, of Fresh Vanilla for C, to make by own wrapping paper and tags. She told me that she found some paper at Anthropologie that had pom poms on it. Another thing I love are pom poms. I used my hot glue gun to affix them. I then saw something on pinterest which inspired me to make these wreaths. I embossed these cards and attached the wreaths with bakers twine. The "to" and "from" are on the back. I love the simplicity of bakers' twine. I also made these pillows today. As always, I really like the subtlety of white on white. And the big bold red stripe on this grain sack pillow is very festive. They are both in my Etsy store. Last but not least, I made hand towels to give as hostess gifts this season. (also in the shop). I just adore the pillows and towels you made using poms poms! Hmmmm.....may need to get one of those cute towels! You're so creative. 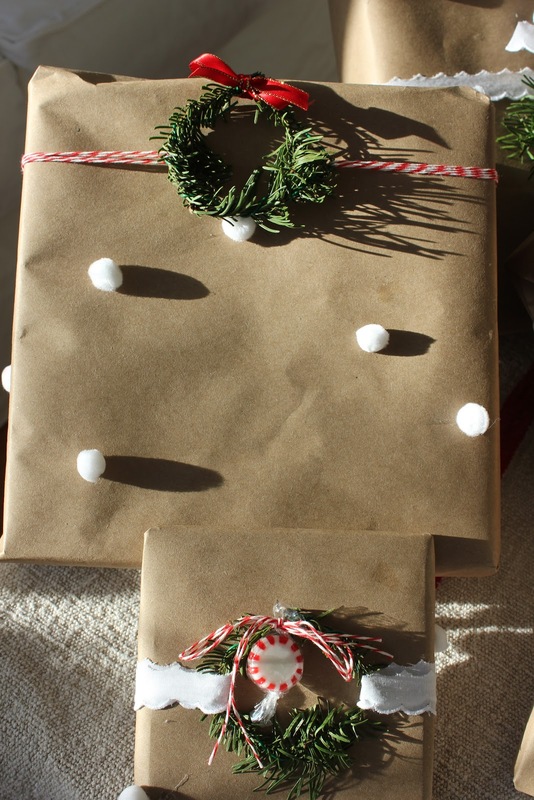 I love your wrapping paper idea and creative tags too. I've noticed that pom poms are the rage this year! I'm smitten with them too. They are so cute and old fashioned. I love bakers twine as well. I ordered some last year and again this year and use it everywhere! So cute, I love rustic holidays! I finally got the gifts for my husband in the mail, so I'll be wrapping them up and have been looking for ideas. Thanks for sharing! I agree with Cheryl, dear Michele! so beautiful !! love the pom pom idea. Love your wrapping--looks like little snowballs--I may have to do something similar. Thanks for inspiring me! Loving your gift wrapping and pillows. So simple and sweet. I am still in the Trying to decide mode~you have inspired me! So lovely! Your Christmas will be beautiful. Wishing you happiness and peace. PS love your Giants cake! Oh Merry Merry Michele ~ What adorable projects! Those little pom poms add a sense of quirky fun to those gifts and pillows. :) So sweet!!!! It's all so cute darling Michelle! I love to use brown craft paper each year and embellish differently...you've shared some great ideas! The Christmas wrap is so cute! I love all your projects, the pom poms are adorable! New Follower! How did I miss this wonderful post Michele? Simply lovely! 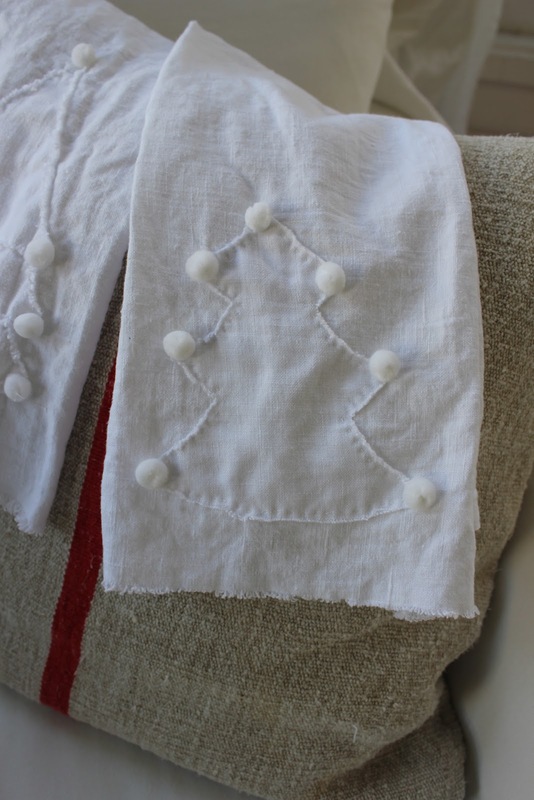 I love the gift wrap idea and especially the Christmas tree pillows, what a beautiful design!